The River Doe and River Twiss are two small rivers that join together just below the village of Ingleton to form the River Greta, a tributary of the River Wenning, and eventually the River Lune. They are two of the most beautiful rivers in the Yorkshire Dales, with the high limestone summits of the Yorkshire Three Peaks overlooking them (Pen-y-ghent, Whernside and Ingleborough). 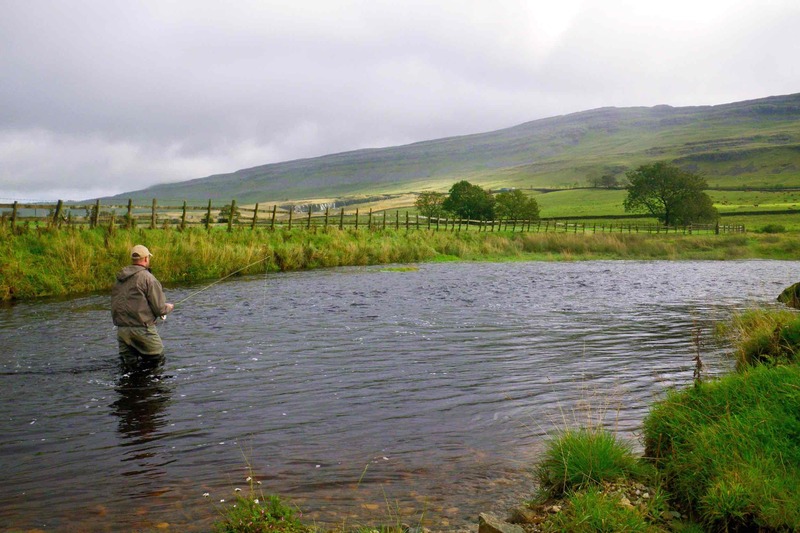 Flyfishing on the River Doe and River Twiss is some of the best that the Yorkshire Dales has to offer. Ingleton is a village in the far west of the Yorkshire Dales, close to where North Yorkshire meets Cumbria, or Yorkshire Dales meets Lake District. Ingleton attracts many visitors, mainly due to its location in close proximity to the Three Peaks, and caving available in the numerous potholes in the area. Ingleton is also well know for its Waterfalls Walk, which follows the River Doe upstream and the River Twiss downstream, past a series of waterfalls over the limestone rock. Fly fishing on the Rivers Doe and Twiss is for wild brown trout, which are present in extraordinary numbers. In many places the brown trout are very small, but in others they can attain a good size for a river such as this. The best I have seen to date is a stunning wild brown trout of 1lb 10oz caught by a client I was guiding. The trout respond to a variety of methods, but it is dry fly that is without doubt the most successful. It is rare not to see fish rising to naturals throughout the season. The River Doe rises at the head of Kingsdale (Kingsdale Head), where it is known as Kingsdale Beck. Further down the valley it becomes the River Doe, before flowing down the waterfalls to Ingleton, where it meets the River Twiss and becomes the River Greta. The River Twiss starts it journey near Chapel-le-Dale, flowing through Twistleton before it descends the waterfalls to Ingleton. Incidentally, Ordnance Survey maps of the area have the two rivers mixed up and incorrectly name them the wrong way round, i.e. the Twiss as the Doe and Doe as Twiss. Looking at both rivers you would expect them to be quite acidic and lacking in fly life, but this is not the case. Both rivers have their source on limestone, making the river more suitable for a variety of invertebrates. The rivers have abundant fly-life with good hatches throughout the trout season. Day tickets for the Doe and Twiss are available from the newsagents shop in the village of Ingleton.